You can ‘step’ into a newly designed infrastructure scheme and have a virtual look around – before breaking ground in the real world. Trail-blazing technology used by multi-disciplinary contractor Trant Engineering for a range of projects in the UK and internationally has won the Southampton-based company plaudits from industry peers. The business, which operates in heavily regulated industries such as energy, water and process, oil and gas, defence, marine and nuclear decommissioning, has been recognised with a leader in digitalisation award. 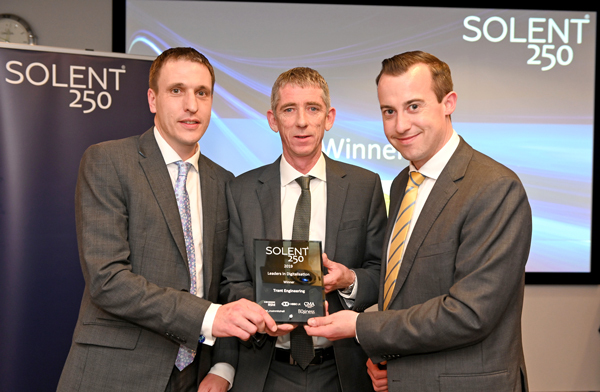 Held by The Business Magazine, the annual awards dinner for Solent 250 companies demonstrates the “breadth of entrepreneurial businesses” across the central south coast of England. Judges stated: “Our winner was in some ways unexpected. It is a large, local family business that for a number of years has seen technology and innovation as a way to set itself apart. Trant Engineering, in its 61st year, employs more than 1,100 people and has a projected turnover of £150 million. James Henderson, Director for Process and Water, Trant Engineering, said: “We developed a virtual reality (VR) model of our products when we didn’t have time to produce a prototype in a tender for a United Nations project. We already used 3D and building information modelling. Brendan Dowd, Business Development Director, said: “Due to the high calibre of our clients, we have to be at the cutting edge of our business. “Smart technology plays an increasingly important role here at Trant Engineering, from the design of complex schemes, such as water and wastewater treatment plants, power stations and oil and gas facilities. “Our IT and systems teams developed an in-house business management system providing both project management and document management. This is a cutting edge, bespoke digital system which impressed the judging panel. “Being awarded the Solent 250 leader in digitisation is testament to the incredible work colleagues do day in, day out, across all parts of the business. Trant Engineering’s in-house engineering capability includes civil, mechanical, electrical, process, automation, telemetry, systems integration and commissioning. Other finalists in the category were Ascenti, Lush Cosmetics, RB Sport and Leisure (Ageas Bowl) and Simplyhealth Group. The Solent 250 is sponsored by HSBC UK, accountants RSM, law firm Irwin Mitchell and CMA Recruitment Group. More than 80 guests attended the dinner and networking event at the Ageas Bowl, near Southampton, with 30 finalists across six categories. Trant Engineering specialises in engineering, procurement and construction – the company is responsible throughout projects, from design and procurement to commissioning and handover. Contract locations include the Channel Islands, Singapore, Ascension Island and Falkland Islands, as well as across the UK.